Effective document security is right by your side with Destroyit Deskside model shredders. These robust machines are engineered to thrive in fast paced corporate environments. 5 models and a variety of shred sizes allow you to choose the perfect shredder for your needs. In today’s business environment, the necessity of shredding sensitive documents prior to disposal cannot be overemphasized. Equally important is having shredders that are up to the task. No company can afford to waste time and money on subpar machines that will have to be constantly repaired or replaced. 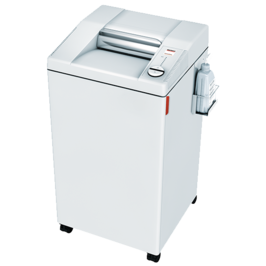 When you purchase a Destroyit shredder, you are investing in a machine of superior quality that will provide many years of trouble free operation. 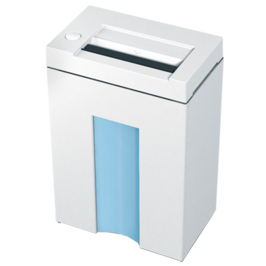 Ideally positioned in a common area and shared by a number of employees, Destroyit Centralized Office shredders combine high performance and innovative technology with industry leading safety features. 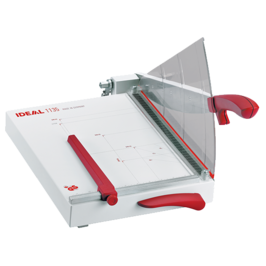 Feed openings ranging from 10 1/4 to 16 inches accept a wide range of document sizes and a variety of cutting heads are available in 4 security levels. All strip- and cross-cut models will accept staples and paper clips and most will shred CDs. Generous bin sizes mean they can operate for long periods before being emptied. An in-house shredding program based around Destroyit High Capacity shredders is the most secure and cost effective way of disposing large quantities of sensitive documents. When you hand over documents to an outside service, you relinquish control of your data security. Shred services are also a never-ending expense which will only increase over time. Destroyit High Capacity model shredders offer optimum solutions for super high volume data destruction. 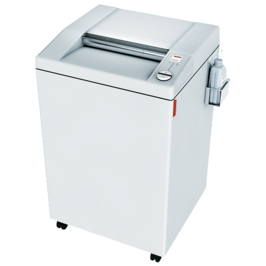 The entry level model 4605 is equipped with a handy feed hopper which allows the user to empty the contents of entire paper bins, including crumpled paper, directly into the shredder. The 4107 and 5009 have powered conveyors which facilitate the fast and efficient feeding of large quantities of documents. 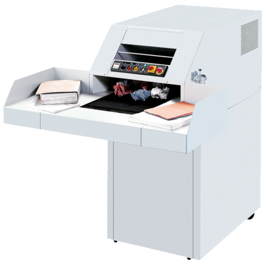 The 5009 has an astounding 600 plus sheet capacity and will shred hard bound documents and 3-ring binders. The F.B.I. estimates that U.S. businesses lose tens of billions of dollars every year due to theft of company data. All the electronic security measures in the world are useless if you’re throwing out confidential hard copies and disks by the truckload. Putting your trust in an outside shredding service to dispose of confidential data for you is not the answer. By outsourcing your company’s document disposal, you effectively relinquish control of the program. In addition, the costs associated with shredding services are at astronomical levels and are not going to decrease. The surest and most economical way to protect your company from data or identity theft is to shred sensitive documents in-house, at the source–in the hardened steel cutting shafts of a Destroyit paper shredder. Manufactured in Germany by MBM’s parent company, Krug & Priester, Triumph cutters are world renowned for their power, precision, and ease of operation. Exclusive SCS safety features put them among the safest cutters in the world. Manufactured in Germany by MBM’s parent company, Krug & Priester, Triumph trimmers are built to the same exacting tolerances as Triumph cutters. All trimmers feature sturdy, all-metal construction and the finest Solingen steel blades. Every Triumph trimmer features stationary or movable transparent Lexan safety guards. All models are tested by independent safety labs and comply with all applicable international safety regulations. Triumph trimmers are certified under a quality management system established in all company areas under the DIN EN ISO 9001:2008 standards. MBM’s folder / creaser line features machines for corporate applications as well as high-volume bindery operations. MBM tabletop folders offer the perfect combination of speed, precision, and ease of use, making them ideally suited for small offices, schools, and corporate environments. Automatic programmable models store fold programs in memory and can be set up to run at the touch of a button. Perfect for digital applications, MBM creasers allow documents printed on heavy or coated stock to be creased prior to folding, creating a crisper, more accurate fold with no cracking. As the world of on-demand printing continues to evolve, so too does MBM Corporation. MBM has assembled a collection of finishing solutions ideally suited for the digital realm. From cutting to creasing to folding, MBM has your digital finishing covered. And when you’re ready to move up to single-pass slitting, cutting, creasing and scoring, look no further than the Aerocut and Aerocut G2. These all-in-one finishing systems will take your digital production to the highest level. 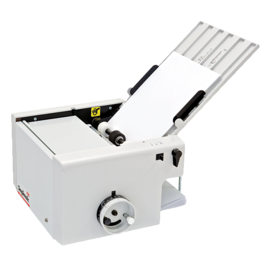 The FC 10 Automatic Collator is one of the most versatile collators on the market today. 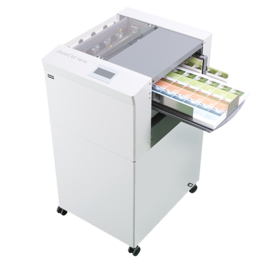 Reliable and easy to use, it interfaces with a variety of bookletmakers including the MBM Sprints and SF2 series. A variety of performance enhancing options are available for the FC 10. 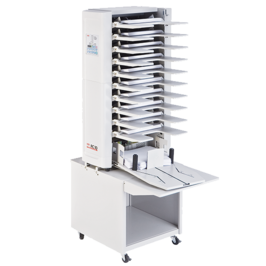 A high capacity stacker can stack up to 3,200 collated sheets (straight or offset), while the corner stapler attachment is capable of stapling up to 10 sheets at a time. The twin tower transport unit allows two FC 10’s with high capacity stacker to work in tandem as a 20-bin collating system. A heavy-duty base mounted on casters allows easy mobility. The FC 10 is certified by Underwriters Laboratories for the US and Canada. Speed and versatility are the hallmarks of MBM bookletmakers and finishing systems. Our Sprint series models enjoy a solid reputation in the print finishing industry for performance and dependability. The revolutionary SF2 bookletmaker utilizes wire-fed stitching technology previously found only in larger systems costing up to three times more. 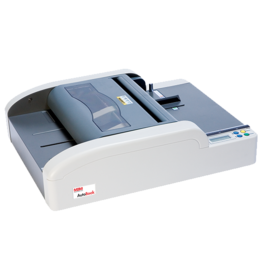 The Sprint 3000 and 5000 bookletmakers have long been regarded as tops in the industry. Paired with an optional trimmer, either model may be combined with a variety of collators including the MBM FC 10 for a complete document finishing system. Both feature easy set-up and adjustment, variable speed, and powered exit conveyors. 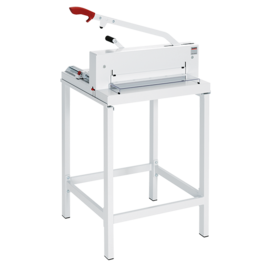 The SF2 bookletmaker utilizes a patented wire-fed stitching system that eliminates the need for pre-formed staples. This low maintenance machine jogs, stitches, and folds up to 65,000 booklets before the spools need replacing. An optional trimmer can be combined with the SF2 for the ultimate booklet finishing system.